Kuala Lumpur, Feb. 15, GNA - Felix Mensah Nii Annang-La, Metropolitan Chief Executive for Tema said Ghana was ready to receive investors from Malaysia to partner the government in its flagship programme of industrialising the country through the one district one factory. Mr Nii Annang-La said this when he led a delegation of Municipal and District Chief Executives to pay a courtesy call on the Mayor of Kuala Lumpur, Tan Sri Mhd Amin Nordin Abdul Aziz. The MMDCEs are part of the Ghana's delegation attending the Ninth Session of the World Urban Forum (WUF 9) in Kuala Lumpur, Malaysia. 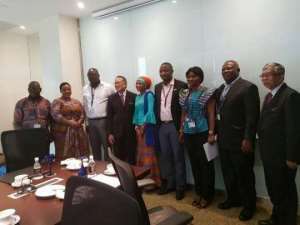 The Tema Chief Executive who is also the National President of National Association of Local Authorities of Ghana said Ghana had the right climate for investment and asked the host to impress on the Malaysian business community to take a look at Ghana in deciding where to invest their resources. He highlighted that Malaysia has a niche agro- business as the leading country in the cultivation of palm oil, which it processes into a number of products, as well as coconut and cocoa. Nii Annang-La said land was readily available in the various districts, and invited the investors to consider Ghana in the selection of investment destinations. The MCE for Agona West, Justina Marigold Assan, said her area had earmarked a large tract of land for agro-processing and sought collaboration from Malaysia. Mr Amin Nordin, who was excited in receiving his Ghanaian counterparts, said there were a lot to learn from his municipality, especially in the area of revenue mobilisation and sanitation. Mr Amin Nordin said commercial property owners pay 12 percent on their rents to the city administration as property rate. The Kualar Lumpur Mayor asked the MMDCEs to provide adequate information to the country's investors who were virtually in the dark about the opportunities in Ghana. He said there were investors who had money but don't know where to go, and advised the delegation to hold a conference with the business community adding that the agro-industry was on the ascendancy, especially with the development of hybrid crops, citing the palm tree, which he said bore fruit in just about four years. He said plantation farming was the life wire of the Malaysian economy, as it fed the country's industries.